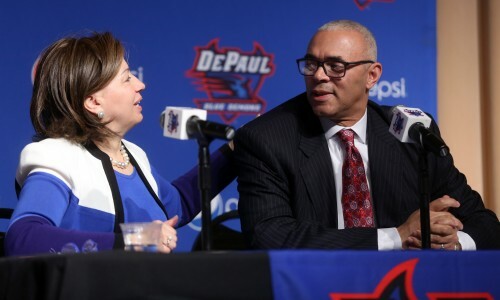 A prideful Dave Leitao’s voice rose as he talked about getting a second chance with the program he left 10 years earlier as Leitao was introduced Monday as the next head coach of DePaul men’s basketball program at DePaul’s Student Center in Lincoln Park. 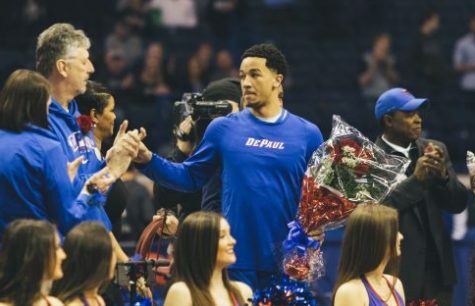 Leitao’s joke was part of a room that was all smiles from DePaul’s end despite the initial curiosity and backlash that came with his rehiring when it was announced Sunday evening. Leitao previously coached at the program from 2002 to 2005, leaving to become the head coach at Virginia. Leitao, 54, said he is looking forward to turning the program around by installing a winning culture built on defense. “Defense is in my DNA and it’s what I was brought up to teach,” Leitao said. “The ultimate goal is to reach the NCAA tournament. And that’s what we’re going to do. It’s going to be really, really soon. 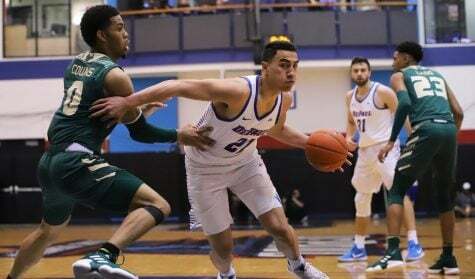 Leitao admitted that returning to DePaul was something he didn’t anticipate two weeks ago. 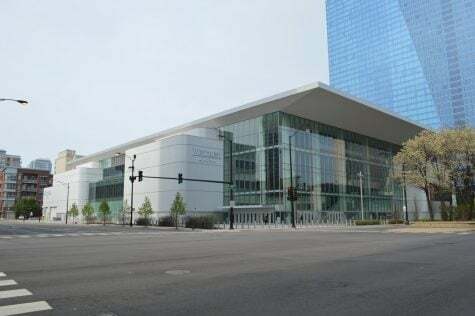 The first interaction between DePaul and Leitao was through Parker Executive Search, a search firm hired by the University to find candidates. Leitao was at the Junior College NCAA Championships when he first received the phone call. 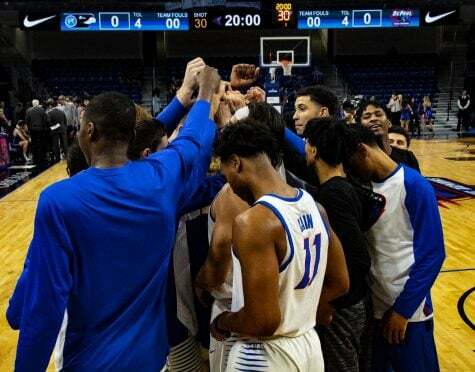 An intrigued Leitao consulted his family, who had previously moved with him 11 months ago for an assistant role at Tulsa, before eagerly taking the job. 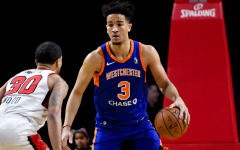 In his first stint with the team, Leitao went 58-34, including two trips to the NIT tournament and a second round appearance in the NCAA tournament. Leitao is the last Blue Demons head coach to bring DePaul to the NCAA tournament, last making it in 2004. 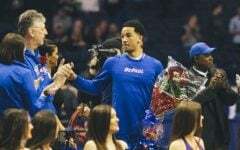 Leitao, however, said that coming back to DePaul is the toughest job he has accepted. “This is an unorthodox situation because I was here and I came back,” Leitao said. “I don’t know how often that’s happened. 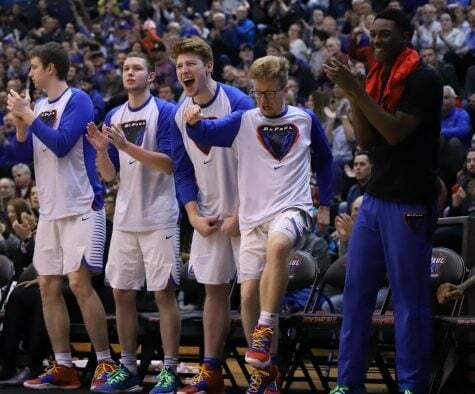 The challenge is to change the perception of the DePaul basketball brand because it hasn’t been successful in a while. Both Leitao and Lenti Ponsetto, though, made it clear the expectation is to win right away. Unlike when former head coach Oliver Purnell was hired, Lenti Ponsetto stressed this wasn’t a rebuilding project. 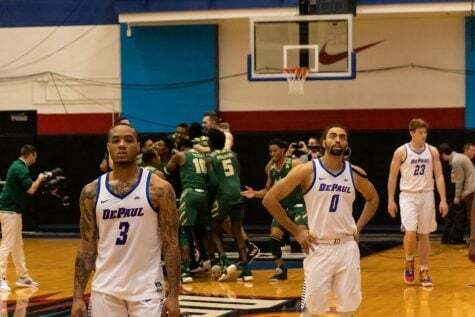 DePaul disappointed this past season and finished 12-20 after multiple losing streaks of over six games. Leitao was chosen over the young up-and-coming head coach candidates like Buffalo’s Bobby Hurley and Valparaiso’s Bryce Drew. Asked why DePaul went with Leitao instead of hiring someone younger, Lenti Ponsetto was aggressive in her answers. 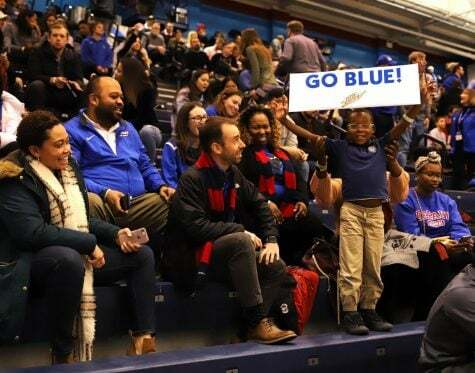 She pointed to Leitao’s experience of having success at other big name coaches when DePaul was in Conference USA, as well as his experience since leaving DePaul. Lenti Ponsetto also pointed to this year’s Final Four, where each head coach is over 60. Lenti Ponsetto said someone’s age didn’t factor into DePaul’s search, repeatedly calling Leitao DePaul’s number one choice. “He’s a proven winner,” Lenti Ponsetto said. “He can recruit kids from all over the Chicago area. We thought he had all the component parts. I feel really confident with our choice. 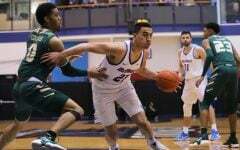 In his 10 years since being at DePaul, Leitao went 63-60 in his four season at Virginia with just one NCAA tournament appearance. 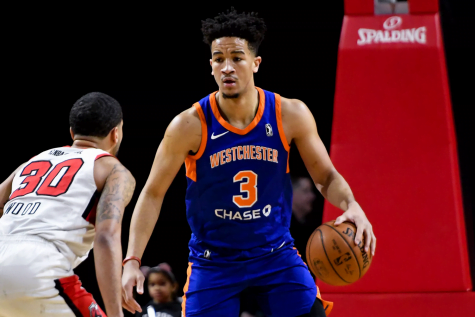 After being fired in 2009, Leitao spent time in the NBA D-League before ending up as an assistant coach at Missouri and Tulsa under Frank Haith, which Leitao fought back tears when mentioning his gratitude. Leitao said he’s a better coach from his tenure at DePaul, particularly on offense and understanding how kids in this generation have changed. Now that he’s hired, one of Leitao’s first tasks will be to assemble a staff. One assistant he’s already announced was keeping Billy Garrett Sr., who was also an assistant with Jerry Wainwright and Oliver Purnell. 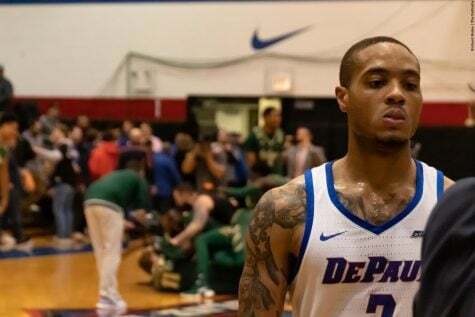 Keeping Garrett Sr. is good news to DePaul guard Billy Garrett Jr., DePaul’s best player and also Sr.’s son. On Monday, Garrett Jr. affirmed his commitment to DePaul while also being impressed by Leitao. Leitao also has to meet with his roster. Based on his initial impressions, Leitao said he’s excited to meet his new group. The mantra he’s trying to instill, he said, is to look toward the future. How is it that Dave Leitao was never approached to become a head coach over the past six years. If hie has such a sterling reputation, why didn’t all those people who thought so highly of him approach him with a job offer. It’s nice that he took DePaul to the NCAA eleven years ago, but what has he been doing the last six years. I can’t believe that any reputable search firm could have dug into a closet full of resumes and pulled up Leitao’s! The culture will NEVER change while JLP is still running the show. I can’t believe the higher-ups support this. They need to run this like a multi-million dollar business (because it is) and not a grade school church league. 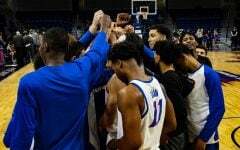 Men’s basketball could do SO MUCH for DePaul. Instead if fails and tarnishes the brand name on a national level. First, she shows up 10 minutes late. Then, she feeds BS for 15 minutes and embarrassingly lists the names of coaches that DL has beaten. That all means nothing. What a waste. I’ll just go put on my Notre Dame hat or U of I shirt and support a school that knows a thing or two about creating a brand and building a sense of pride.